A 17-year-old boy has had his world completely changed for the better following an operation to remove a brain tumour at the Hospital Regional in Malaga. The surgery was carried out to remove a tumour from the left area of the brain, a part of the brain that is responsible for language and was carried out while the patient remained awake. Prior to the operation, the patient has been suffering from daily epileptic fits stopping him from leading a normal life. While at the same time the surgeons removed the tumour they also carried out a procedure to remodel cerebral functions so that the patient would be able to speak normally. The operation took place during July and only this week the neurosciences department of the hospital held a press conference to explain the details of the operation. The tumour was first diagnosed when the patient was just seven-years-old after it was found to be the cause of his epilepsy and while he underwent surgery, it was not possible at the time to remove the entire tumour due to it being located so close to the language area of the brain. As years went by the young man’s epileptic fits became more frequent and it was apparent that what remained of the tumour had grown, yet doctors could not operate on a child as the patient needed to be awake for the procedure. After ten years, doctors noticed that the tumour was pushing the language area of the brain from the left hemisphere of the brain towards the right and that if left alone it could leave the patient’s ability to speak impaired. Over a period of a week surgeons gradually began to apply direct electrical stimulation to the cerebral cortex in order to move the language function of the brain from the left side to the right and then remove the tumour. The operation proved to be a complete success effectively curing the boy's epilepsy with no harm done to his speech. This is a significant breakthrough for other patients with epilepsy who are unable to undergo surgery in case it should damage other parts of the brain. 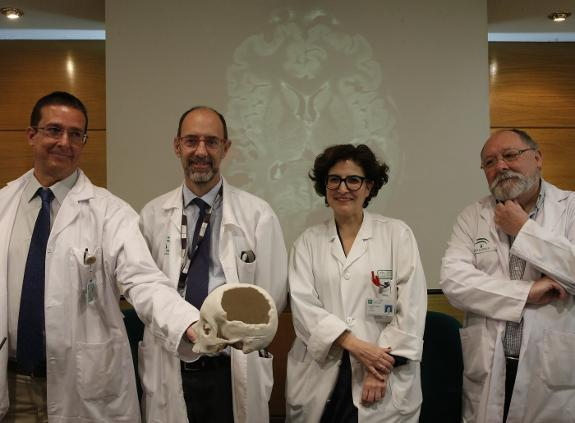 The surgeons and doctors who performed the operation are Head of Neurology, Pedro Serrano; the coordinator of the neurophysiology service, Victoria Fernández; the head of adult neurosurgery, Guillermo Ibáñez and neuropsychologist, Luis Muñoz.